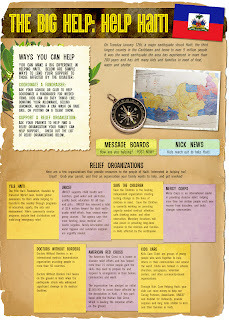 The website features message boards for kid discussions about the aftermath, as well as a list of organizations (Yele Haiti, UNICEF, Save the Children, Mercy Corps, Doctors without Borders, American Red Cross, and Kids Care) that kids can encourage their parents to investigate ways to help the people of Haiti. Nite encouraging viewers to get involved. Discovery Communications-Hasbro Joint Venture President and CEO Margaret Loesch unveiled the official brand and logo for the children’s network, set to launch in fall 2010. Moving forward, the network will be known as “The Hub” and will reach approximately 60 million homes on what is currently the Discovery Kids network. The Hub will offer young viewers and their families novel and compelling content, ranging from new comedies and animated adventures to live-action franchises and game shows — all celebrating the core childhood concepts of fun and play. The network’s tone will be thrilling, modern and dynamic, both on-air and online. These qualities are represented by The Hub’s spiral logo, which symbolizes a catalyst of action and imagination. In addition, the network will benefit from the strong DNA of its two parent companies, Discovery and Hasbro, which share a 50/50 partnership in the venture. Content on The Hub will feature rich storytelling with active, multidimensional characters and unexpected heroes. The network will tap into the best production talent in the industry for shows that will reinvigorate children’s programming. Additionally, The Hub will incorporate cherished Hasbro properties, including Transformers and My Little Pony, and popular Discovery Kids franchises such as Adventure Camp and Flight 29 Down as a part of a diverse and robust lineup of original and acquired programming. The Hub’s online home, hubworld.com, will become an entertainment destination in its own right, offering kids access to video clips, interactive games and community features that extend the experience of the network’s content. Ms. Loesch is a member of the KIDS FIRST! National Board. 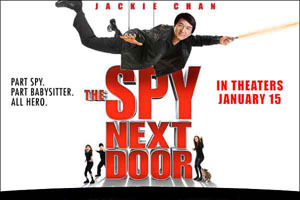 The Spy Next Door refers to Bob Ho (Jackie Chan), a square but safe next-door neighbor and boyfriend of Jillian, a single mom with three kids. She is glad to have an honest and dependable guy in her life. The kids are dead set against the relationship because he’s, well, just a big geek. When Mom needs to leave town suddenly, Bob offers to care for them, thinking it will give him a chance to make the kids like him. What no one knows is that Bob is actually an accomplished Chinese spy working with the CIA who has just worked his last job and has retired in the hopes of settling down with Jillian. The kids put Bob thru the ringer, but trouble really starts when the bad Russian guys come after Bob and the kids. Jillian breaks up with Bob when she realizes he has put her kids in danger. In the end, the kids come to his defense, the couple gets married and a new family is born. What will appeal to a youth audience the most are the action scenes. The good guy spy, with help from the kids, fight the evil Russian baddies. There are lots of martial arts scenes but the action is almost cartoonish and we see no blood and guts. There is only scene where a bad guy gets a bloodied nose. The heart of the film is delivered by Jackie Chan when he tells his girlfriend’s teenage daughter that family is what you make – who you love and who loves you – not just the blood that runs in your veins. It’s good advice and she grows to accept him as a potential step-father. It also helps her embrace her own family after feeling she didn’t belong. Watching Bob trying to care for three unruly kids is truly humorous. The emotional arc of the kids letting down their defenses and allow a new man into their lives is something many kids can relate to, whether it’s happened to them or they have seen friends experience similar things. The film is certainly derivative of other James Bond-for-kids type movies such as Spy Kids but doesn’t really add anything original or memorable. The true appeal of this film is Jackie Chan, who gracefully moves between his two identities – the super square pen salesman who lives next door, and the super cool and capable Chinese spy working with the CIA. Plus, he’s funny. That surprised us. The siblings fight a lot and say mean things to each other but they do come around in the end. There is no profanity and sometimes Jackie Chan’s accent makes his speech difficult to understand. KIDS FIRST! recommends this for an audience of 6-12 who will enjoy it for the humor and action. Nintendo of America Inc. and Netflix, Inc. [Nasdaq: NFLX] today announced an agreement that will allow Netflix members who are also owners of Nintendo’s Wii™ home console to instantly watch thousands of movies and TV episodes streamed from Netflix directly to their TVs. Netflix is scheduled to go live on the Wii console this spring in the United States at no additional cost to Netflix members who have a plan starting at $8.99 a month, a Wii console and a broadband Internet connection. The partnership between the two companies will extend the reach of content streamed from Netflix farther than ever before, thanks to the mainstream popularity of the Wii console. Wii remains the fastest-selling home console in history, and reaches more consumers than any other device that currently supports streaming movies from Netflix. In December 2009, Nintendo sold well in excess of 3 million Wii consoles in the United States. Wii is the top-selling home video game system of this generation, and as such brings the Netflix experience to a broad and diverse mass market. With 11.1 million U.S. subscribers as of Sept. 30, 2009, Netflix continues to expand the ways in which its members can watch movies and TV shows streamed directly to TVs via a range of Netflix-ready devices such as the Wii console. Netflix memberships start as low as $8.99 a month, and members also can receive unlimited DVDs delivered quickly to their homes. At the same time, consumers continue to demonstrate a preference for Wii consoles, which offer tremendous value, whether measured in fun games, shared experiences or the suggested retail price of just $199.99. To enable their systems to stream content from Netflix, Wii owners will need a Netflix instant-streaming disc for the Wii console, which will be available at no additional cost to Netflix subscribers. The free disc looks and operates the same as a disc-based Wii game, and the entire user experience will feel natural and intuitive to Wii console owners. Netflix members and Wii console owners can now reserve a free instant-streaming disc by going to www.netflix.com/Wii. Once available in the spring, the discs will be delivered for free by first-class mail. When the instant-streaming disc is inserted into a member’s Wii system, an array of movie and TV choices will be displayed right on their TV screen. These titles will be conveniently organized into a variety of categories based on members’ personal preferences and will include popular genres, new arrivals and members’ individual instant Queues. Using the Wii Remote™ controller, members will be able to choose a movie or TV episode to watch from their instant Queues or pick one directly from any of the lists. They will also have the ability to read synopses and rate movies, and will have the option of fast-forwarding and rewinding their selection. Netflix adds another dimension to the Wii console’s diverse online features, which range from downloadable new and classic games in the Wii Shop Channel, to online multiplayer gaming with games like Mario Kart™ Wii, to video highlights and information about titles for the Wii and Nintendo DS™ systems via the Nintendo Channel™. Science education just got even more exciting with the launch of LIFEBOAT TO MARS, a fun, new, interactive educational game on PBSKIDSGO.org. Designed by Red Hill Studios and PBS KIDS GO! in close collaboration with leading educational researchers and funded by the National Science Foundation (NSF), the game follows a unique “staircase” design that merges an educational sequence with more than 40 challenging game levels, eventually leading to the opportunity for kids to “mod,” or create, their own version of the game to share with others. As players work to rebuild a virtual ecosystem in outer space, they learn standards-based biology concepts. LIFEBOAT TO MARS is at PBSKIDSGO.org/lifeboat. LIFEBOAT TO MARS is set in the future — September 15, 2041. Mars Lifeboat #43 — a supply ship carrying experimental DNA to colonies on Mars — suffers a devastating explosion on its way to the red planet. The microbe population is wiped out, plants are wilting and the few animals left are starving. With programs including SID THE SCIENCE KID, CURIOUS GEORGE, CYBERCHASE, DINOSAUR TRAIN and the fall 2010 premiere of THE CAT IN THE HAT KNOWS A LOT ABOUT THAT!, and Web properties such as EEKOWORLD, MEET THE GREENS and LIFEBOAT TO MARS, PBS is providing more opportunities for children to further develop an interest in and appreciation for science, technology, engineering and math (STEM). As a critical area of development, PBS is strengthening its offerings around this curriculum area to invite children to explore natural and life sciences — both personally and globally. PBS Parents (PBSPARENTS.org) and PBS Teachers (PBSTEACHERS.org) invite parents and teachers to partner in this learning journey and find developmentally appropriate science learning tools and resources based on a child’s age or grade level. At a White House event in January, 2010, PBS and local PBS stations announced the annual PBS Teachers Innovation Challenge (pbs.org/teachers/innovators/) to honor and celebrate talented teachers and to showcase best practices in support of the growth and advancement of the teaching profession. The National Science Teachers Association is supporting the Challenge by encouraging participation of science teachers at every level of school and will recognize innovative science, technology, engineering and math educators among the 50 Challenge winners who will be announced this spring. 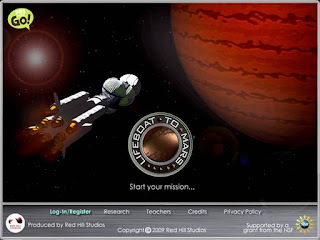 Red Hill Studios is a leading developer of innovative educational games and software. It is also conducting pioneering research on the use of gaming design approaches for education and health. Prior to this collaboration with PBS on LIFEBOAT TO MARS, it partnered with Twin Cities Public Television and PBSKids to create the successful Dragonfly TV games that have been played more than 20 million times since 2006. For additional info, visit the Web site at http://www.redhillstudios.com/. Here is some great information by Bryan Farrish Radio Promotion about how Indie filmmakers can promote their films on the radio. Before you answer “I’ll use the web”, let’s look at a definition of the web as it can be applied to promoting indie movies. True, if you could pay to have your movie on the homepage of Myspace for 24 hours, this would be “promotion” by anyone’s definition. And you could also mass-email consumers who are likely to want your movie, but first you’d have to build up the email list (which requires some other purchase or promotion). So short of this, let’s define the web mostly as a “delivery” (mailing or download) vehicle, and leave “promotion” to things which generate immediate, trackable sales. Which brings us to traditional media, and in particular, radio. Remember that traditional media were developed for the very purpose of selling product. And why radio? Because all other traditional media have lost LOTS of users, while radio has not. Radio is so good at reaching almost every person in the U.S. every week, that Apple finally gave up its war on radio, and is now INCLUDING a radio built-in to every new Ipod Nano (radios have already been included in the Iphone and Ipod Touch, and are slated to be included in every Google Phone). The numbers make it clear: Radio reaches 300 million Americans every week, whereas there have only been 30 million Ipods sold (10 percent). Back to film: The way radio works for indie films is this: You do a radio interview with a principal of the film (star, director, producer, writer, even an investor), and this compelling interview will cause listeners to (1) call the phone number that you announce during the interview, or (2) visit the film website; both for the purpose of buying the movie. When radio interviews are done correctly, most of the purchases will come by phone, because of the fact that 50 percent of all radio listening is done in cars and while doing other things outside. And these listeners ALL have cell phones. Why do film interviews work well on radio? Because radio listeners are not listening to anything else. They are only listening to your interview. By contrast, people can LOOK at many things at once (bouncing their eyes around) and thus not focus on any one thing, so although your ad/banner/text/etc may be on their screen, it is mixed into everything else that people are looking at on their computer and in their room. Thus many more “impressions” of a visual ad are required, compared to an audio interview, to generate a sale. People can’t listen to more than one thing at once (and if they try, they get annoyed). So people set things up so they are hearing just one thing: A person, a song, a telephone call, or a radio. Matter of fact, when you are being listened to by a radio listener, it is common in the broadcasting business to pretend you are talking to ONE person, not an audience, because this is how the listener thinks and feels… that you are speaking directly to THEM. They are focused on just YOU. Then there is involvement. If you have ever been interrupted while you were doing any project at all, then you know the feeling of thinking “would you please just let me finish this first? !” It feels better to finish a project (before moving on), than it does to stop halfway through the project and try to come back to it later. Same with radio interviews. Compared to seeing ads/banners/text/etc, which can all be glanced-at and forgotten, a radio interview needs to be listened through to its end, or else the listener starts feeling that they are missing something. This phenomenon has created something called “driveway listening”, which is when people get home but don’t want to get out of their cars until an interview is finished. This all applies directly to your radio interview. When you tell about the story of the film’s conception, casting, filming, editing, etc, especially if you INCLUDE some sound bites from the film, what you end up doing is building up the idea of the film in the listeners mind. At this point, many listeners already want the movie, and it’s just a matter of what stands between them and the purchase that will determine if they buy it. MOST sales will be right at this moment, over the phone, when you announce the purchasing phone number. Then there will be a few sales later via your site, also. This is what makes radio so trackable. Since most movie sales come from listeners dialing their cell phones and ordering right at that moment, there is no question which radio interview did the best for you. Listeners DON’T need more selling; they are READY to buy at that moment, because of the involvement they just had listening to the principal of the film describe all the facets of the movie. And if the price of the movie is $19.99 or less (especially if it’s under $9.99), most of these listeners will not hesitate to buy it on the spot. If it’s over $19.99, you will start getting fewer orders. What type of films make for the best radio interviews? Ones with odd, intriguing, or controversial topics, especially documentaries. These topics make for good interviews even without a film; but with one, the topic is taken to a whole new level. Movies make for great on-air-giveaway items for radio listeners too. General entertainment movies can also do well if there is some other tie-in to the radio stations, such as plot location, filming location, the industry of the plot, etc. Who do you choose to be the person that will do the interviews? A good clear voice is important, yes, but what is most important is a jovial, likeable attitude who responds well when fun is being poked at them. Radio, even AM talk shows, do not like to be black-and-white factual all the time. Little jokes, innuendos, tongue-in-cheek comments, all work together to keep the radio hosts (and listeners) smiling. And when the hosts are smiling, they will keep you on the interview longer. The longer you are on, the more involved the listener gets, and the more times you get to announce your how-to-purchase contact info. You are currently browsing the Granny Ranny's Coming Attractions weblog archives for January, 2010.